I like running. Whoa, it feels weird to even type it, let alone say it aloud. 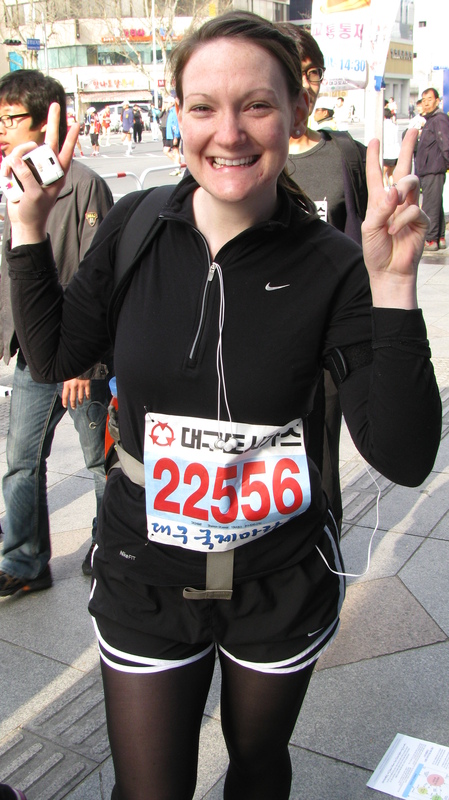 Since moving to Korea one of my friends (Bridgette) somehow got me into running. 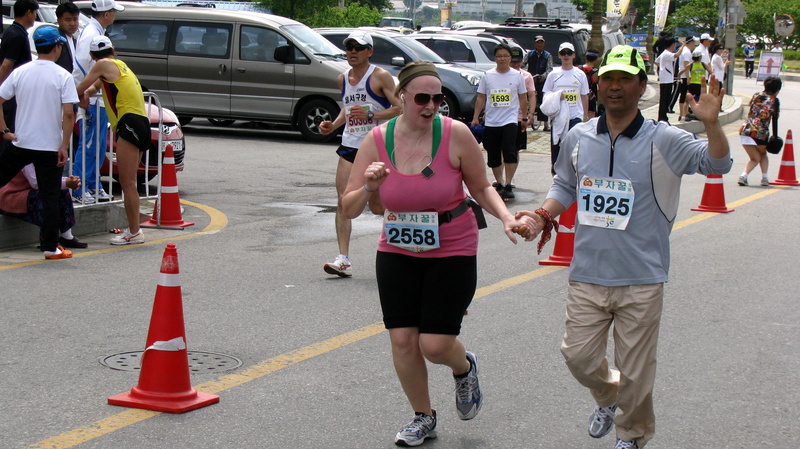 Waaay back in November she proposed that we run the Daegu marathon together. I, naively agreed to this proposition. 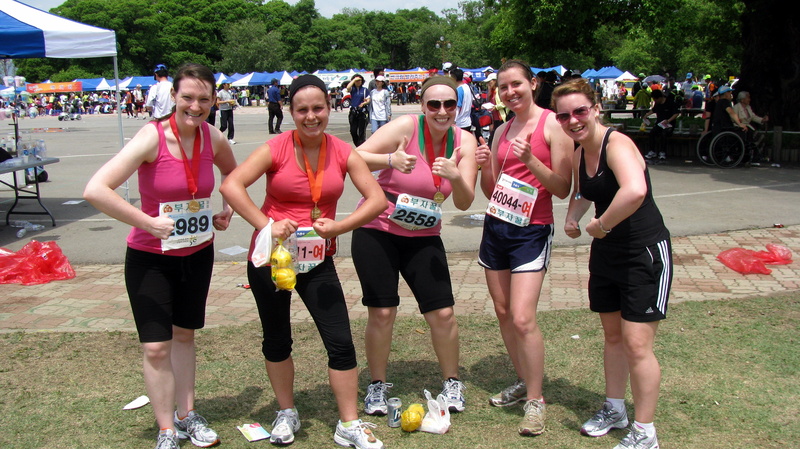 I didn’t even know how long a marathon was to be honest. I can tell you that when I did find out, I nearly pooped myself. So I settled on running the 10k. 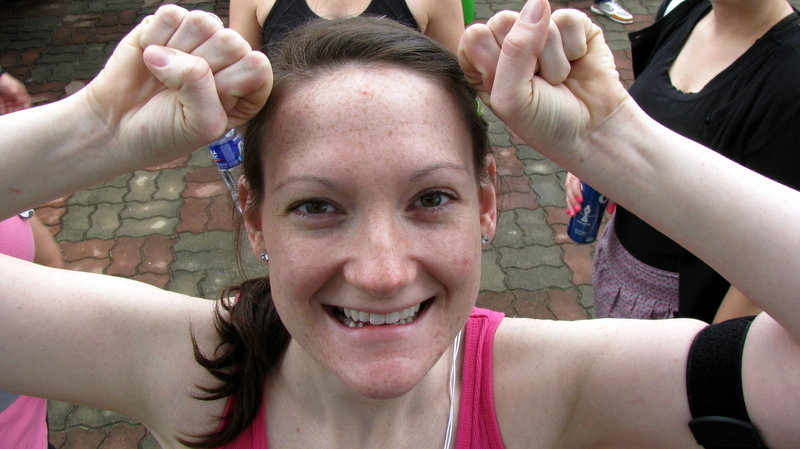 I had 5 months to train for a 10k- more than manageable. The only thing was that I hated running. Every time I got on that treadmill I was only thinking about WHEN I COULD GET OFF OF IT. 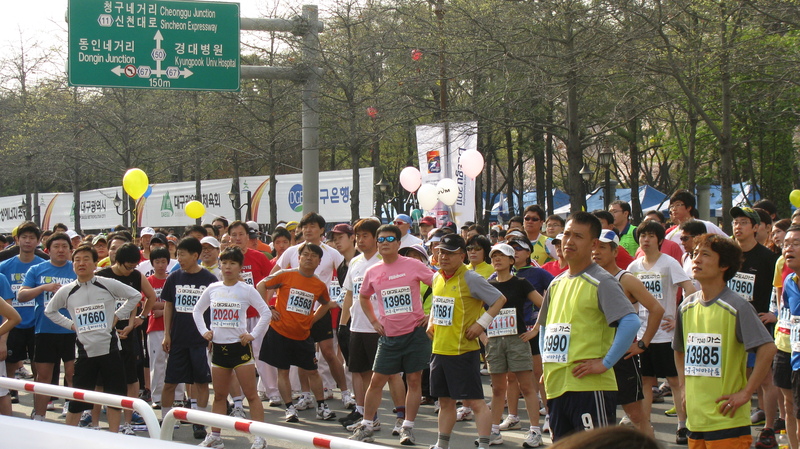 Daegu Marathon April 10, 2011. 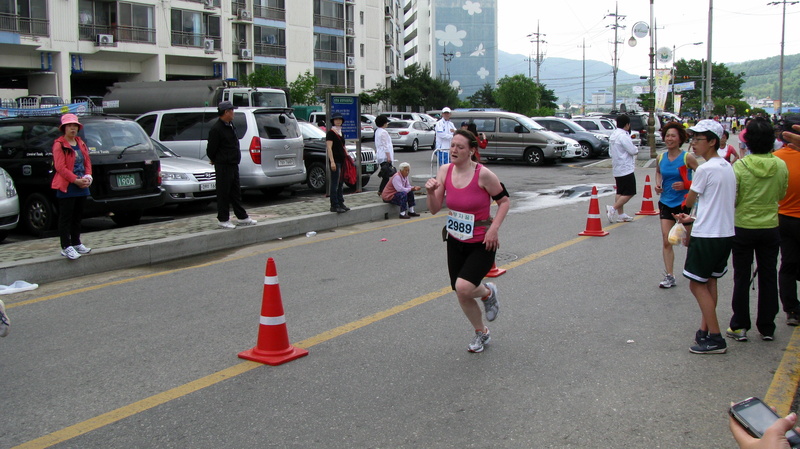 The week prior to the Daegu Marathon I was a wreck, I was really doubting whether or not I could complete the 10k in under 1 hour and 30 minutes. 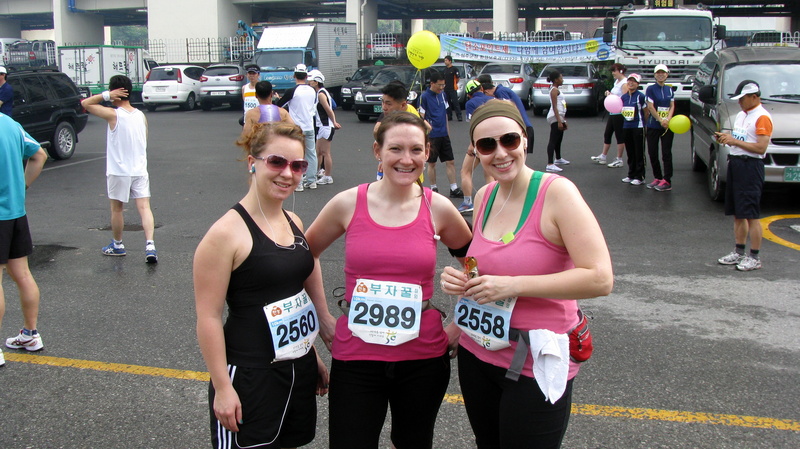 Although, by this time I actually am enjoying running- I’m still a beginner! 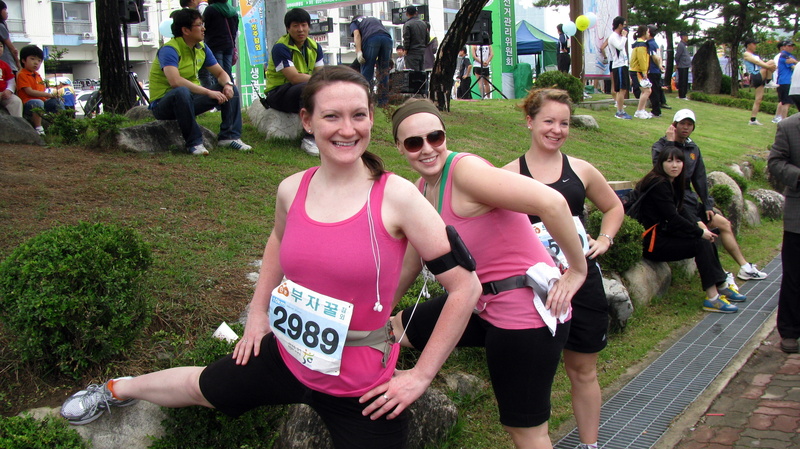 Luckily, Lana came to Daegu this weekend to support me and she kept me from going insane. 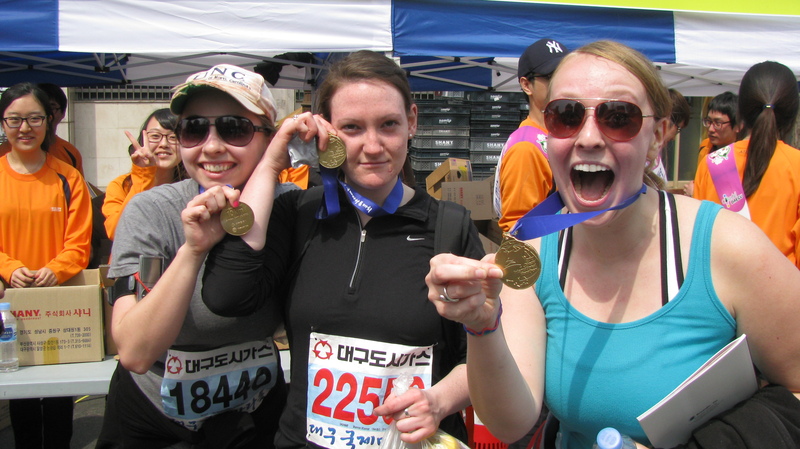 The day of the race I got really pumped up~ the vibe around the race was so exciting and it felt so good to be a part of it! 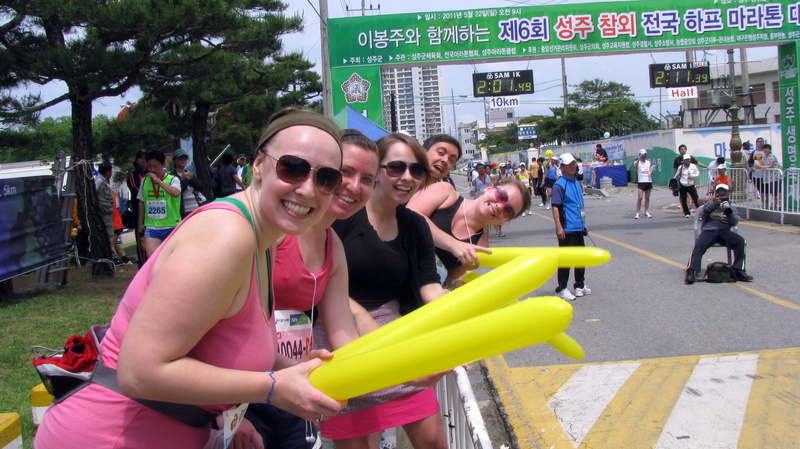 Daegu International Marathon. 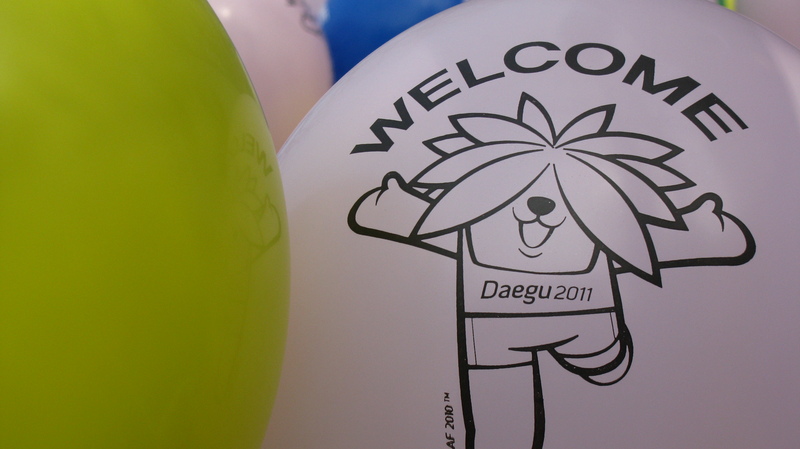 He is the Daegu man! With a little help from my ipod and this little magical gel and all of the adrenaline from the cheerers on the sidelines I was feeling really good during the race. 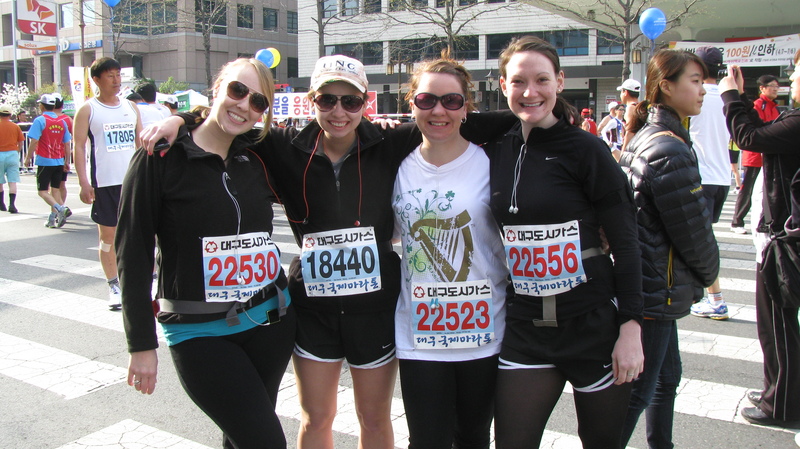 I paced myself with my friend Bridgette who is a runner and we finished together!!!! 1 hour, 8 minutes and 56 seconds! The short shorts girls leading stretches! 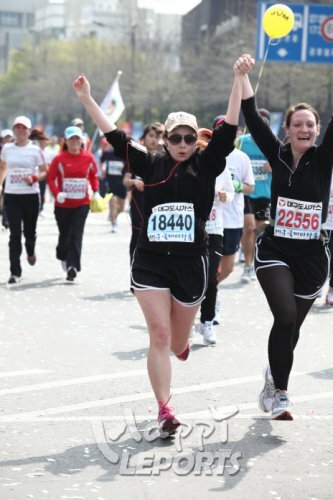 Bridge and I finishing the 10k together! Seongju. Sunday, May 22, 2011. In the time between the Daegu race and the Seongju race I hit the gym for realz. I was determined to beat my time. Seongju is where my friend Jez lives just outside of Deagu, so we all took a trip to run in her town! It was a beautiful, sunny day- perfect running conditions! I wanted to stop running so bad. Erin finishing with her friend she made along the way. Kristen finishing with an impressive time. THE ONLY PEOPLE CHEERING IN THE WHOLE TOWN!!!! Seriously, the biggest difference from the Daegu race and the Seongju race was the LACK of people cheering for you!! It was so eerie, but we were the loudest people in the town haha. Cheer!!! Its a race!! 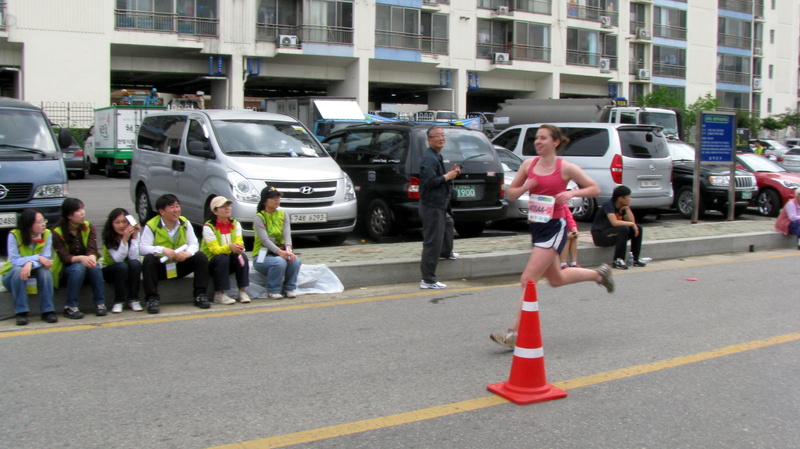 During the Seongju run I was able to shave off 5 minutes off of my time! I couldn’t be more proud and it only makes me want to keep improving and keep running!! 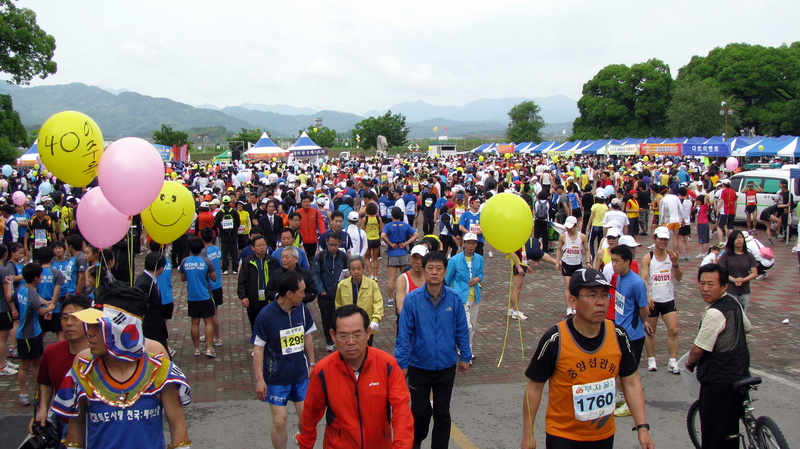 : ) Next up, Jeju-do marathon. 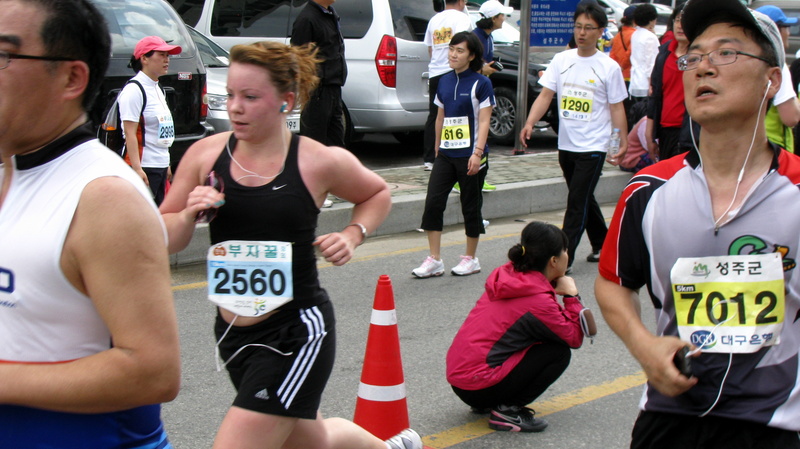 think you will become addicted to running, and your time will keep improving. So cool. Ted and Candi.